Enhanced Hood Design: The all-new one-piece hood showcases a refreshed color scheme with bold decals to signify the raw power found within every Apache Sprayer. You’ll be turning heads everywhere you go. An optional vented and heated leather seat circulates air, keeping the operator cool on warm days and warm on cool days. The multi-position steering wheel does not require a tight grip, even in turns. Load-Distributing Frame Structure: An added cross member provides improved load distribution under the product tank for better balance even in rough field conditions. Robust Adjustable Axle (Optional): Choose the standard fixed axle or upgrade to an adjustable axle for increased flexibility in the field with its high-capacity and splined kingpins. 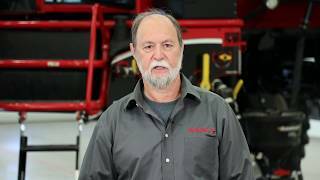 Raven Advanced RS1 Steering System: Are you ready for the most accurate high-speed steering system in the industry? The advanced RS1 system provides next-level steering accuracy with several additional features in one convenient package — including advanced steering electronics, Viper® 4+ advanced field computer, product application control and boom controls. In-Cab Remote Support: Meet your new wingman. Remote support comes standard with an unbeatable free two-year subscription. Get all the help you need with remote troubleshooting, software updates and operator assistant functions. The subscription includes access to the machine and precision data for faster troubleshooting, over-the-air updates, remote desktop service help, data logging, machine diagnostics and much more. Bluetooth® Capabilities*: You’ve appreciated the power of Bluetooth in your truck for years, it’s time to bring this great feature to another cab in your life — the cab of your Apache Sprayer. Enjoy the all-new Bluetooth- ready Jensen® audio system with hands-free calling and SiriusXM® satellite radio. Crystal-clear sound from four Jensen speakers will keep you entertained during the long days (and nights) ahead. 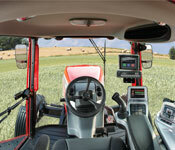 *Standard cab on the AS640 comes with two speakers and does not include Bluetooth hands-free calling. Positive-Position Joystick: The new positive-position joystick has been custom engineered to make sprayer adjustments more precise and easy to navigate with its versatile, dual-axis configuration. Operators will enjoy the friction hold that grips position instead of returning to “start” in previous model machines.